This fast growing, evergreen perennial climber will quickly cover a sunny wall, arch or obelisk and produce large, sweetly-scented flowers from midsummer to the first frosts. 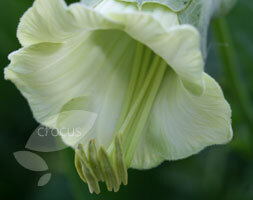 A rarer form of Cobaea, the white bell-shaped flowers add an exotic touch to a summer planting scheme. Plant it near a window or busy pathway to enjoy the perfume.